The Station is in the church of St. Eusebius, priest of Rome, who suffered for the faith in the Arian persecution under the emperor Constantius. This church is the dominicum Eusebii, recorded in an epitaph of 474 as the home of the “heroic Roman priest, Eusebius.” Eusebius was condemned to death by starvation by the Arian Emperor Constantinus in 357. 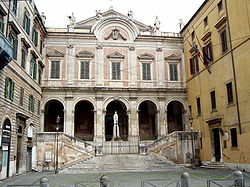 His home was converted into a titulus, one of the original twenty-five parishes of Rome, and this oratory is mentioned in the Councils held by Gelasius in 494 and by Symmachus in 499. It was formally erected into a station by Gregory the Great. Restored many times, the church was reconstructed in 1238 by Gregory IX, who dedicated it to Saint Eusebius and Saint Vincent, martyr, who died on January 22, 304. The relics of Saint Eusebius are interred beneath the high altar. Location: Sant’Eusebio is located on the north corner of the Piazza Vittorio Emmanuele II, in the vicinity of the Basilica of Saint Mary Major.